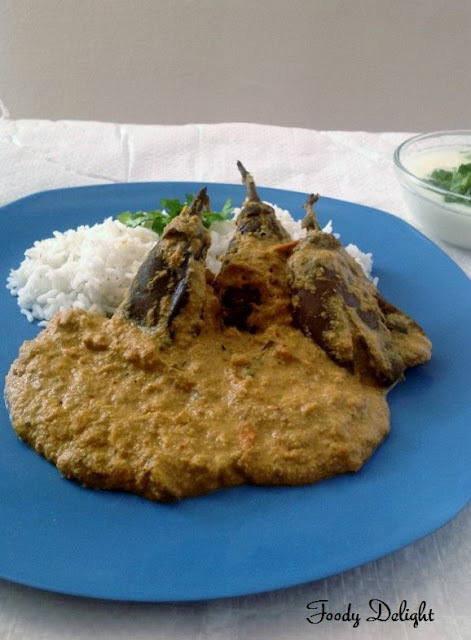 Bagara Baingan is one of the traditional dish of hyderbadis,a culinary delicacy from the city of Nizam’s and is perhaps the best eggplant dish I ever had. 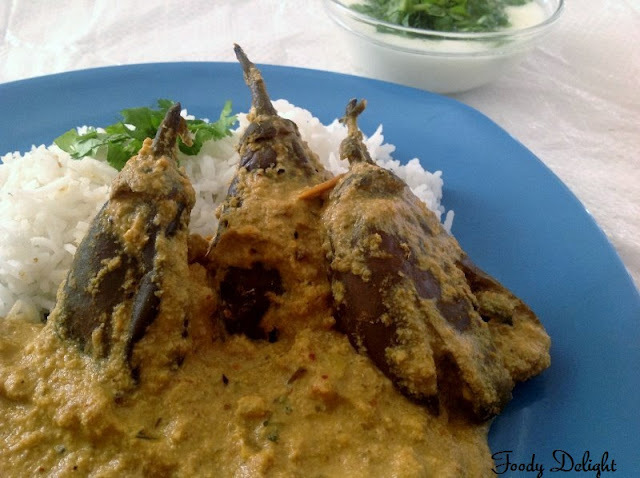 Bagara Baingan is in which baby eggplants are cooked in the hyderbadi style of spicy gravy. There is the slight variation in my recipe, the ingredients I have added is my own approximation,turned out best and tasty too. Roast all the ingredients that are mentioned in the" Part1". Roughly chop the ingredients that are mentioned in the "Part2" . Grind the ingredients of Part1 and Part 2 together to a smooth paste by adding required amount of water. Wash the brinjals and slit them in between, then cross,keeping the stem intact. Saute brinjals into oil till they are 50% done. when done remove from the pan. Keep it aside. Take a same pan, add little more oil,if required and add cumin seeds and fry for about 30 to 40 seconds. Then add chopped onion and fry till onion becomes light brown in colour. Then add tumeric powder,green chilly paste,ginger paste and garlic paste.Fry till raw smell of the paste goes off. Now add chopped tomatoes and cook till they are soft. Add smooth grounded paste (mix of Part1 and Part2),red chilly powder, garam masala powder and salt.Stir well and cook till the oil separates out of the gravy. Adjust the consistency of the gravy by adding required amount of water. Now add the sauted brinjals to the gravy. Cover with the lid and cook on low flame for about 30 minutes. Cook till the brinjals become soft. Bagara Baingan is ready to serve. Bagara Baingan can be served with naan,roti or with plain rice. TQVM for sharing another vegetarian menu..
Never tried Bagara Baingan..looks yum! 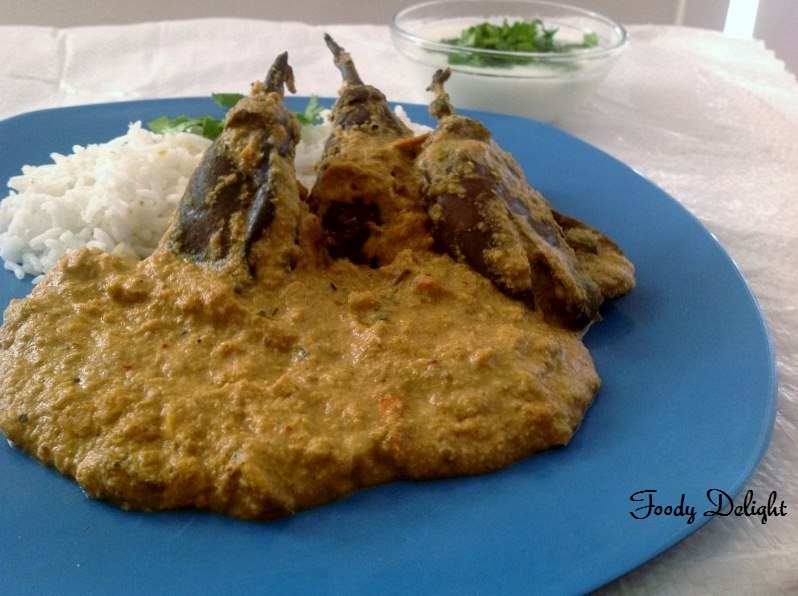 Yummy looking bagara baingan, looks superb.